During this symposium, you will learn about contemporary practices for the examination, evaluation, diagnosis, and intervention of neuromuscular disorders from a distinguished interdisciplinary team of professionals. The symposium will feature a traditional lecture format augmented by a session in the Anatomy lab of the Rangos School of Health Sciences where participants will examine an upper extremity and shoulder girdle cadaveric pro-section. 7:50 a.m. - 4:50 p.m.
Identify the clinical features of Paramyotonia and Myotonia Congenita. Differentiate between Paramyotonia and Myotonia Congenita through electromyographic testing. Compare methods of evaluating ulnar nerve dysfunction. James L. Cosgrove, M.D is board certified by the American Board of Physical Medicine and Rehabilitation with added qualifications in Pain Medicine, the American Association of Electrodiagnostic Medicine and the American Board of Independent Medical Examiners. Has served on numerous professional societies and committees and is a Past- President of the Pennsylvania Academy of PM&R. He is currently employed by TriRivers Musculoskeletal Centers/UPMC . Alexander M. Spiess, M.D. is Assistant Professor of Plastic Surgery and Orthopaedic Surgery at the University of Pittsburgh School of Medicine. He is the Director of the Department of Plastic Surgery Hand Surgery Fellowship, and the Co-Director of the UPMC Center for Nerve Disorder. He treats all problems related to the hand, wrist, and elbow, including fractures, ligament, tendon, and nerve injuries. Don Drolet is the owner of Standing Crane Tai Chi, Qigong and Meditation, LLC in Pittsburgh, Pennsylvania. He is board certified to teach in numerous Tai Chi forms through the Tai Chi for Health Institute founded by Dr. Paul Lam, A Tai Chi master and retired Western Medical Doctor. Don is also certified as a professional Qigong instructor through the Tai Chi and Qigong Healing Institute. John G Eddy PT, ECS is a private practice physical therapy clinical specialist in electrophysiologic testing with forty years of experience. He is a former chair of the American Board of Physical Therapy Specialties, and is a former adjunct instructor at the University Of Pittsburgh, Department of Physical Therapy. P.J. Savie, MS, PT, ECS is a private practice physical therapy clinical specialist in electrophysiologic testing. He has served as an adjunct instructor in anatomy for the John G Rangos Sr. School of Health Sciences at Duquesne University since 1991. He is a former teaching assistant for the Anatomy and Cell Biology Department at the University of Pittsburgh. Mark E. Shelton, PT,ECS is a private practice physical therapy clinical specialist in electrophysiologic testing with thirty-five years of testing experience. His practice is focused on evaluating neuropathic cases in a neurology group practice setting. He is a former adjunct instructor at the University of Pittsburgh school of Physical Therapy and Shenandoah University in Winchester, Virginia . Robert D Baker, PT, DSc, ECS is a private practice physical therapy clinical specialist in electrophysiologic testing with thirty-seven years of experience. He is currently appointed as a clinical electrophysiological item writer for the American Board of Physical Therapy Specialties. Raymond G Jurewicz, PT, ECS is a private practice physical therapy clinical specialist in electrophysiologic testing with thirty-six years of testing experience. He is a former adjunct instructor at the University of Pittsburgh school of Physical Therapy. He is currently appointed as a clinical electrophysiological item writer for the American Board of Physical Therapy Specialties. 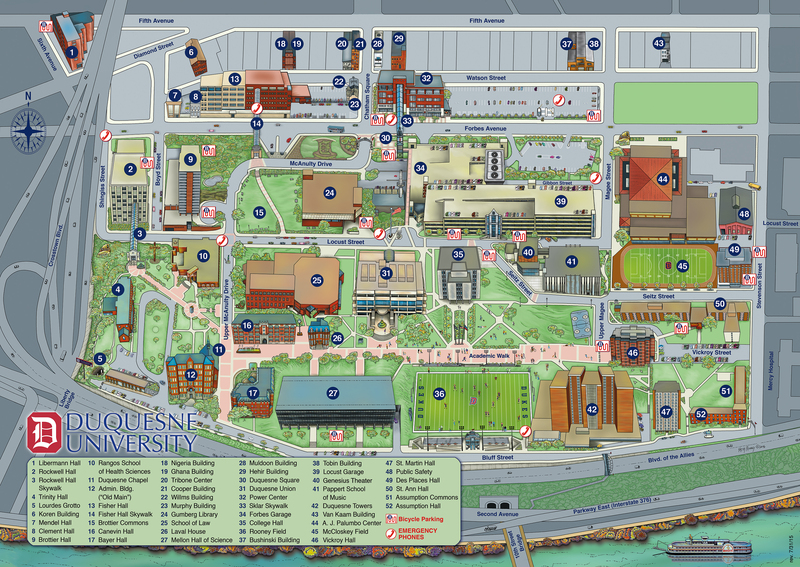 Campus Map - Symposium is on the 1st floor of the Rangos School of Health Sciences; Park in Forbes Avenue Garage.